Please don’t lick the frog. When your dog gets sick, you feel helpless, especially at times when you want to rush her to the doctor but the office is closed. The closest emergency clinic is hours away, so you search the Internet for answers. In our case, our Golden Retriever who’s not even a year old yet started acting as if she was hallucinating, almost convulsing. Her head jerked around. She flinched. Her eyes searched for something with every flinch, darting around with the jerking motion of her head, closer to the floor than usual. Then she swung her head back to her side and bit at herself. She stopped for a second then repeated this jerking and searching, flinging her head around to her side. So believable was her search that we looked for bugs, fleas, wounds, anything. We bathed her and hugged her. We searched her body with our eyes, our hands. The last time I’d searched for something my own eyes couldn’t see but someone else could I was in my grandmother’s one-room home when she asked me why the little girl was looking at her over there by the door. I told her that she was just watching over her. This time, my 11-month-old Golden Retriever searched for something, and couldn’t tell me what she saw. But, just like the little girl, I knew whatever it was, something was wrong. This time, I also knew that this Golden was experiencing some sort of hallucination and it had nothing to do with an aging mind. I promised to get her help though, just like my grandmother. This time, however, the doctor gave us good news. She would be fine. The bad news was that our Golden, Bailey, had licked a poisonous toad. Our own form of paranoia set in. I had a nightmare that giant frogs were climbing the walls to get to her and I was yelling for help. In fact, in our area, Miami-Dade County, Marine Toads are dangerously commonplace. 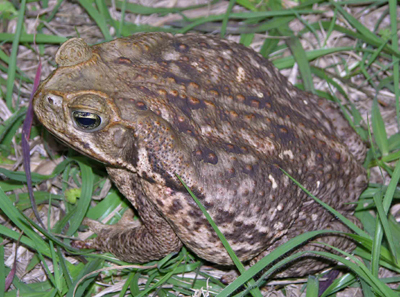 According to the Florida Wildlife Extension’s website, the Marine toad, which is sometimes referred to as the Giant Toad or the Cane Toad, is most prevalent in Miami-Dade and Monroe Counties in Florida. When it is touched or feels threatened, it produces a toxic substance from its head. Dogs and cats can die from this. Figuring out whether or not your dog or cat was poisoned starts by noticing a change in their normal behavior. Our dog very quickly showed signs of paranoia and convulsive movements. You can also check their gums, which turn red. When attempting to relieve your pet of the symptoms or rid the progression of them, you should take a hose and rinse their mouths being careful to let the water run out of their mouths, rubbing the gums, teeth, and tongue. Not much else can be done once your dog is exposed to the poison. Some people say you should give them milk. Others say that feeding them peanut butter helps. I gave my dog a bath thinking that something had bitten her, but when she continued the erratic behavior, I knew we needed to have her checked. Preventing poisoning in the first place. Know what’s lurking in your surroundings. After taking her to the doctor and confirming that this wasn’t a bite or even an injury to the head. I realized that we often visited a lake that was about half a mile away. Those toads were all over there. How did they get in our backyard? The Marine Toads are able to climb walls and burrow under ground. Since this is Florida, every thing is basically a lake because of the rain. Water and insects provide them with perfect breeding grounds. My whole family admonished me for letting her out in the backyard without a leash. I simply bit my tongue, having warned them that we shouldn’t get a dog, knowing that I’d be the one to care for her, knowing I would be blamed when things went wrong, loving her just as much or more than they would and having to endure the guilt that came with it. Then, holding her in my arms through the night and after the effects of the poison had worn off, I found a love I’d thought that I’d lost so many years before. She breathed with me and lay her head next to mine, a comfort I’d last felt with my grandmother who passed a few years ago.